You’ve got several choices for holiday films in theaters now from Best Man Holiday to Free Birds to Frozen. Along with these is Black Nativity, writer/director Kasi Lemmons‘ adaptation of the classic Langston Hughes play of the same name and a musical that celebrates the birth of Jesus while making subtle, but powerful, connections between that birth and contemporary socio-economic realities. While Langston Hughes’ play, Black Nativity, simply recounts and celebrates the birth of Jesus, Lemmons’ script prefaces this celebration with the story of a young man, Langston (Jacob Latimore), whose single mother, Naima (Jennifer Hudson), struggles to make ends meet. 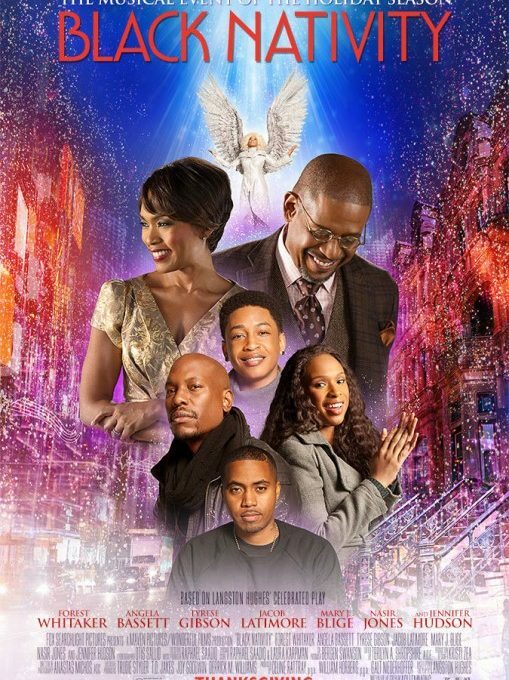 Even though she’s estranged from her parents, the Reverend Cornell (Forest Whitaker) and Aretha (Angela Bassett) Cobb, she sends Langston to spend Christmas with them while she tries to find work. Langston travels from Baltimore to Harlem and immediately has trouble adjusting to the big(ger) city. He is wrongfully arrested, which deeply embarrasses his straight-laced grandparents, who are highly-respected and influential members of their community. The sudden arrival of his grandson, further stresses out Rev. Cobb, who also works frantically to prepare for the yearly Christmas pageant. Langston, loathe to either connect with his grandfather or attend the Christmas service, just wants to get back to his mother and spend Christmas with her. Langston is desperate to give his mother a Christmas present, but he is short on cash. He connects with a mysterious man, Tyson (Tyrese Gibson), who reluctantly tells him that he can provide him with a gun to rob the local pawn shop. As the Christmas Eve service gets underway, Langston must make a life-changing decision as he learns that Tyson holds the key to his past and his mother’s estrangement from her parents. Jennifer Hudson as Naima and Jacob Latimore as Langston. While I prefer older musicals to contemporary ones, I found Black Nativity particularly compelling and more than just your standard holiday, family-friendly, musical fare. Its explicitly religious context was of obvious interest to me, particularly the character of Rev. Cobb and his role in both his church and the community at large. While ministers do not often fare well in Hollywood productions, Lemmons has given us one of the most honest portrayals of a minister ever. He’s fully human and, as such, fully flawed. He preaches and practices, at least in his community, love and acceptance; however, he is unable to embody these virtues in his own home. He embraces Jo-Jo (Luke James) and Maria (Grace Gibson), a poor, unwed, pregnant couple that attends his church, but he continues to alienate his own daughter, who made similar choices years ago. Beyond the religious characters, themes of forgiveness and reconciliation are foundational to Black Nativity and are enacted in powerful ways. While these themes find ultimate expression with Rev. Cobbs’ family, they more importantly impact the larger community. I just mentioned Rev. Cobb’s treatment of Jo-Jo and Maria, who are obvious modern-day iterations of Joseph and Mary. This, I believe, is Lemmons’ strongest socio-economic statement, drawing connections between the birth of Jesus and modern-day Harlem. In the process, she strongly suggests that the way(s) in which we embrace people such Joseph/Jo-Jo and Mary/Maria can be salvific for our broken relationships and communities. Latimore, Angela Basset as Aretha Cobb, Hudson, and Forest Whitaker as Rev. Cornell Cobb. Underneath its musical veneer, Black Nativity is also an important piece of social commentary and, as a result, could make an interesting conversation partner with films like 12 Years a Slave and Fruitvale Station. Black Nativity reveals, in subtle ways, the lingering socio-economic effects of slavery, so powerfully portrayed in 12 Years a Slave. While Black Nativity portrays families broken by economic inequalities (a key theme of 12 Years a Slave), it also reveals that such brokenness is also a result of personal responsibility and (in)action. Like Fruitvale Station, it reveals the tension between systemic injustice(s) and individual responsibility (Naima might find herself in tough economic times, but both she and her father are partly to blame). As a result, Lemmons has given us a film that is a combination of genres that have been historically important in the history of African American cinema, the musical and the socially-conscious drama. It might be a stretch to say this, but her film feels like a mashup of films like Cabin in the Sky and Charles Burnett‘s Killer of Sheep. Black Nativity also benefits from solid performances all around. Is there anything that Forest Whitaker can’t do? Angela Bassett conveys all the gravity of a minister’s wife, especially one caught in between the love for her husband and a grandson she doesn’t know. Though grounded in music, Jacob Lattimore has a bright future as an actor. Tyrese Gibson returns to his musical roots, while also revealing acting abilities that stretch beyond the action-adventure roles to which he has been relegated. Black Nativity (93 mins.) is rated PG for thematic material, language and a menacing situation and is in theaters everywhere.